-Isis wears the Sun-disk Crown with cow’s horns and the hieroglyph of Her name is above it; in Her left hand She holds the Ankh (the symbol of Life). -Horus wears the “Pschent”, the Double Crown; the God holds an harpoon and a rope in His right hand, and the Ankh in His left. -Thoth wears an Atef Crown with ram’s horns; the God recites from a papyrus. Horus wears the “Pschent” Crown, and with the rope in His left hand and the harpoon in His right hand He spears the hippo/Seth. 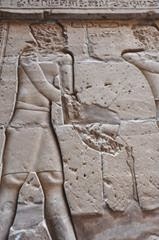 Isis wears the Sun-disk Crown with cow’s horns, and in Her left hand She holds the Ankh. 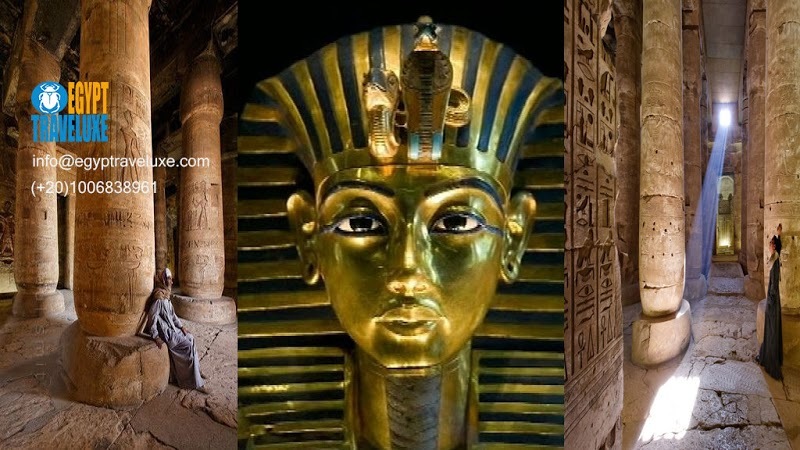 -the King wears the Hemhemet Crown (the triple Atef Crown), and with His harpoon He pierces the hipp o/Seth. The First “Act” of the Dramatic Ritual is the “Ritual of the Ten Harpoons”. 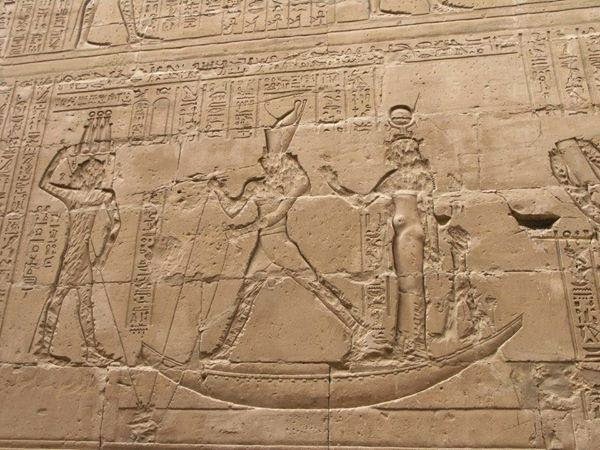 It consists of five scenes; in each scene Horus and His boat are represented twice together with His Followers, the Harpooners (“Daimones”, “Divine Spirits” of Horus). The “Ritual of the Ten Harpoons” celebrates the ten victories of Horus against Seth on Earth, in Egypt, from Upper Egypt (the South) to Lower Egypt (the North), and each scene contains two battles: in the first scene Horus fights and triumphs over Seth in the region of Behdet/Apollinopolis Megale, and in the five and last scene the battle and the victory of Horus are located in the Eastern regions of Lower Egypt (near the border with Asia). On the boat Horus of Mesen, crowned with the “Pschent” snares the hippo/Seth with the rope, and pierces his testicles with the harpoon (the seventh harpoon). The hippo/Seth is lying on his back. Behind Horus there is the lion-headed Harpooner (a “Daimon”, a “Divine Spirit” of Horus) Whose name is “His speech is Fire”, with an harpoon in His right hand and a knife in His left hand. With the harpoon in one hand you grap his hide, and make use of the rope with the other hand: Your spear has bitten his bones, and I see Your blade in his belly! You Who are in Heaven and on Earth, fear Horus! You Who are in the NetherWorld, do Him reverence! He has appeared in glory as a Victorious King Who has conquered the Throne of His father! 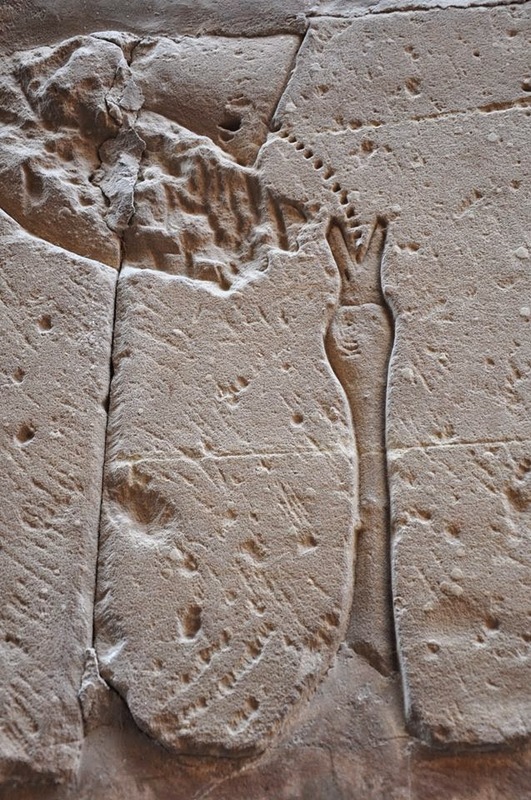 The right arm of Horus is like that of the young hunters. Horus of Behdet, Great God, Lord of Mesen, crowned with the “Pschent”, snares the hippo/Seth with the two ropes in His left hand, and pierces his snout with the harpoon (the “Three-barbed Harpoon”) in His right. Isis, in the bow of the ship, snares the hippo/Seth with two ropes. 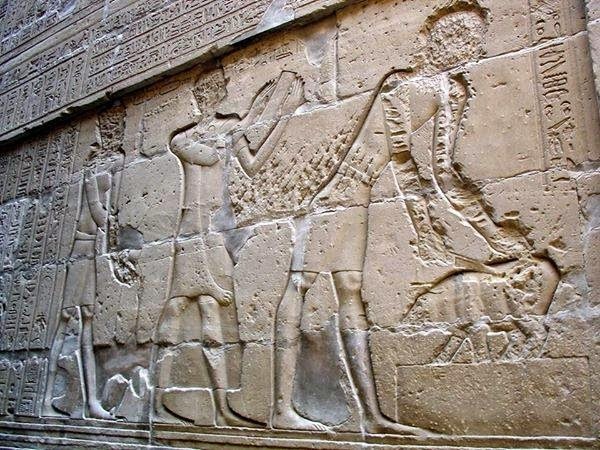 The King crowned with the Hemhemet Crown (the triple Atef Crown) spears the hippo/Seth in the back of the head with the harpoon. Behind the King there are two running men, each with an harpoon and a large dagger in the hands. They are called “the Royal Children and Crew of Horus, the Harpooners of the Lord of Mesen, the valorous Harpooners of Horus of Behdet, Who thrust to make an end of His enemies”; They are “Daimones”, the Divine Spirits of Horus. “He cannot escape from Your grasp, my son Horus! Take the harpoon, Horus, take the harpoon! I, I am the Lady of the harpoon! and the loud-screamer Seth is under my power! Appear on the bank! Make shine Your weapon at the back of the beast of prey (Seth)! Rip open his skin, cut up his ribs! Come in, people of Horus, and look at Horus the Victorious One! I do not forget the night in the marshes, in the times of turmoil! Horus of Behdet, Lord of Mesen, standing on a podium (land) and crowned with the “Pschent” spears with the harpoon the head of the hippo/Seth. Thoth, crowned with the Atef Crown with ram’s horns, holds in His left hand the Ankh and a papyrus roll; His right hand is uplifted towards Horus, as a sign of blessing and protection. 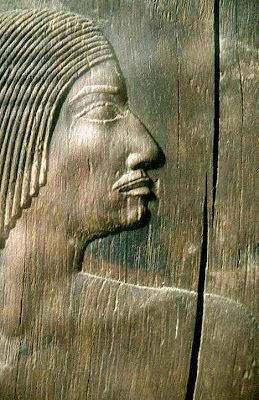 Horus of Behdet, crowned with the “Pschent”, holds the sceptre and the flail, the royal insignia. The Queen, standing on a podium, wears the Cow Horns Crown with two feathers, and rattles a pair of sistra in Her hands. 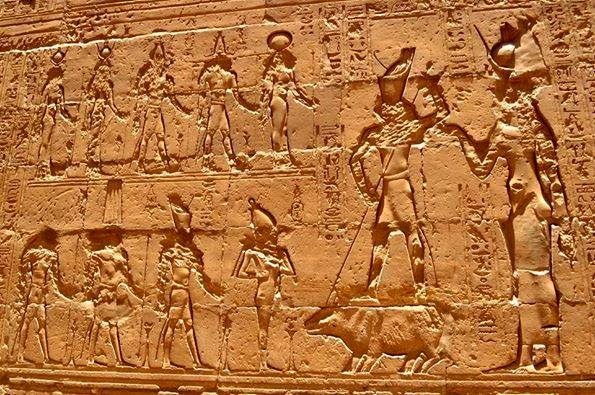 the first three in the upper line are the Upper-Egyptian Royal Princesses and the Women of Buto; the three Women in the lower line are the Lower-Egyptian Royal Princesses and the Women of Busiris. Isis wears the Sun-disk Crown with cow’s horns and the hieroglyph of Her name is above it; in Her left hand She holds the Ankh,and with Her right hand the Goddess supports the upraised left arm of Horus. Horus of Behdet, Lord of Mesen, crowned with the “Pschent”, stands on the back of the hippo/Seth, spearing his forehead with the harpoon. Facing Isis and Horus there are nine Divinities with a sceptre in Their left hands and the Ankh in Their right (Osiris Onnophris holds the sceptre and the flail, the royal insignia). 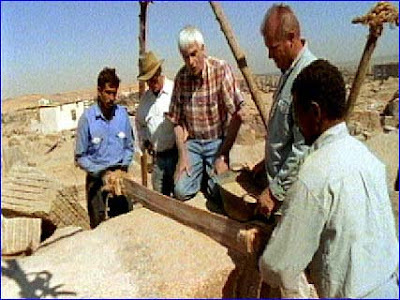 In front of each God there is an altar with the portion of the dismembered body of Seth assigned by Horus to the Gods “as a meat-offering” following the instructions of Isis. -The King, crowned with the Khepresh, the Blue Crown of War, pours grain from a cup into the open beak of a goose. -“The Chief Lector, Scribe of the Sacred Books, Imhotep the Great, son of Ptah” wears a leopard skin and recites from a papyrus. -A man, called “the Butcher of the Majesty of Ra who cuts the hippo” with a knife dismembers the body of the hippo/Seth.